With its sprawling cityscape, massive population, and metropolitan charms, Chicago isn't necessarily a place that you would think of as being a great destination for hikers. But, as it turns out, Chi Town actually sits close to some fantastic trails, many of which give urban dwellers a chance to escape the hustle and bustle of life in the Windy City on a regular basis. In fact, there are more than a hundred trails of varying lengths and difficulties within easy driving distance of downtown, often making it difficult to choose which one to actually walk. With that in mind, we've combed through many of those options and have come up with five of our favorites, each of which has something unique and special to offer. So, the next time you're in Chicago and looking to stretch your legs, why not give one of these trails a go. Those living in, or visiting, Chicago who are looking for a surprisingly scenic walking route within the city limits themselves should checkout the Lakefront Trail. At 18 miles in length, it offers plenty of distance to cover, wandering along the shores of Lake Michigan and through lovely urban parks along the way. The towering cityscape makes for a dramatic backdrop, although at times it is easy to forget you're still in the city at all. The route is paved and very easy to follow, which makes it highly accessible for hikers of all ages and experience levels. This is a mixed-use trail however, which means you'll share it with runners and cyclists too. While the trail isn't as secluded as some of the others on this list, it is easy to reach, offers a variety of landscapes to walk through, and is a great way to explore the metropolitan area on foot. 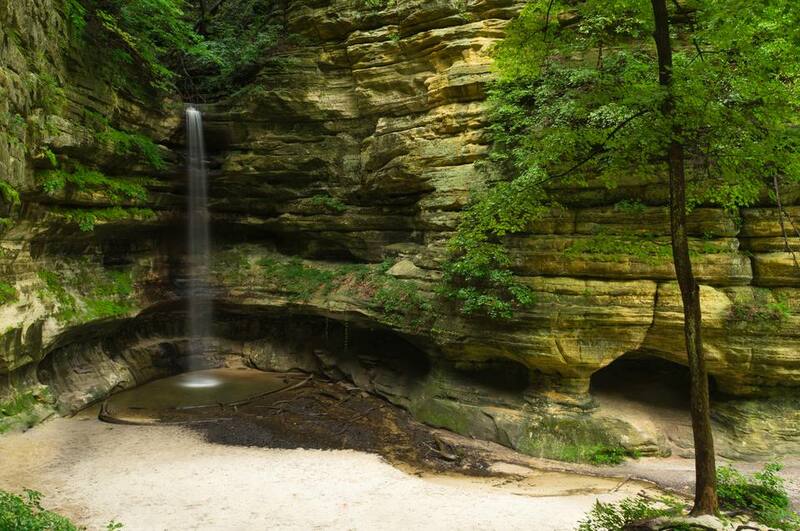 Located about an hour and half outside of the city, Illinois's Starved Rock State Park is a destination that is well worth driving for. With over 13 miles of hiking trails to explore, visitors will find themselves wandering in and out 18 jaw-dropping canyons, many of which include spectacular waterfalls as well. The landscape in the park is completely unexpected and is a magnificent spot for travelers looking for a bit of outdoor adventure. For a true hiking challenge, head to the 9.4 mile Illinois Canyon Trail. The route links up some of the park's shorter trails to provide a grand tour of the entire area. But be warned, it doesn't include any manmade walkways or stairs to help you navigate the landscape so you'll have to be somewhat adept at backcountry route-finding. The Indiana Dunes National Lakeshore is located just an hour away from Chicago, covering more than 15 miles of protected and undeveloped shoreline along Lake Michigan. The park features a 4.7-mile hiking route known as the Cowles Bog Trail, which wanders past lakes, through black oak savannas, around marshes, and down the beach, giving visitors a chance to witness some of the local fauna and flora as they go. Other sections of Indiana Dunes feature hiking routes as well, with more than 50 miles of trail to explore in total. That should be enough to keep visitors busy for awhile. The Waterfall Glen Forest Preserve, located in nearby DuPage County, features 11 miles of mapped and marked hiking trails, with many more miles of unmarked routes to explore as well. Those trails pass through lush forests and open prairies with limestone outcroppings dotting the landscape. Rolling hills and ridges formed by glacial movement from the last ice age provide unique topography to hike as well. The park is home to 300 species of mammals, reptiles, amphibians, and other creatures, making it a popular place with those who enjoy spotting wildlife. There is even an onsite orienteering course for those who want to brush up on their navigation skills. The trail system in the Kankakee River State Park offers plenty of options for hikers (not to mention bikers, trail runners, cross country skiers, and more). The trails stretch for miles along both sides of the Kankakee River and border a wildlife management area as they go. This gives hikers ample opportunity to spot deer, raccoon, wild turkeys, an a variety of other creatures along the trail. One of the highlights of the hike is passing through towering limestone canyons and spotting waterfalls along the way. The walk isn't particularly strenuous, but its proximity to the river and the rolling landscape makes it a lovely place to escape from the city for awhile. And since it is only about an hour away, the park is quite easy to reach too.